The Power in Your Heart (The Secret Quotes) | Law of Attraction Plus: The Secret revealed! There is a mighty power in your heart. To experience this power firsthand, the next time you are in a conversation with somebody, imagine that your words are coming from your heart, rather than your mind. While speaking, stay focused on your words coming from your heart. As you do this you will feel a wave of utter bliss move through you. As you become practiced, you will see the effect of your heart on the person you are speaking with. 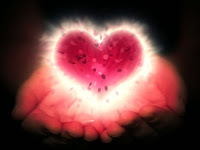 The power of your heart will also reach many others, as nothing can get in the way of its powerful radiation.